Arayot Cheering in the New Session! We started second session with a very busy and fun filled Sunday. The חניכים (campers) arrived at מחנה יבנה (Camp Yavneh) in the afternoon, and as soon as the parents left we took everyone outside to start playing name games and icebreakers. The בנים (boys) played a game with their מדריך (counselor) Sam’s rugby ball, and the בנות (girls) hung out outside around the table in the girls area. We all went back into the bunks for shower time and then headed back outside to take a tour of camp. Our tour ended at the תורן (flagpole), where the entire camp met us for our first מפקד (flag lowering) of the session. We headed into the חדר אוכל (dining hall) for a delicious dinner of pizza and Caesar salad. After dinner, Arayot had our firs t פעולת ערב (nighttime activity), where we played various games in small groups with different מדריכים. One group passed an orange around a circle using only their necks, and another group taught a fun cheer that everyone in the עדה (age group) now knows. 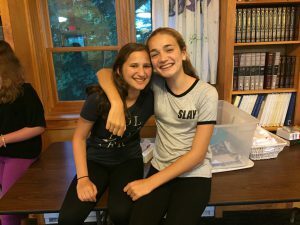 The בנות (girls) and בנים (boys) went back to their respective bunks to write up the month’s bunk rules and then, after fun filled night, went to sleep. This morning, Arayot got to participate in upper camp davening and got to choose if they wanted to go to מנין מחיצה (mechitza minyan) or מנין שוויוני (egalitarian minyan). Everyone came together for waffles for breakfast in the חדר אוכל and then went back to their bunks for ניקיון (cleaning time). This week, we’re looking forward to an overnight for our אחלה יום, and the rest of second session!